This is now my preferred recipe. Less sugar, and tastes great! You may mix in fresh fruit before baking if you wish. 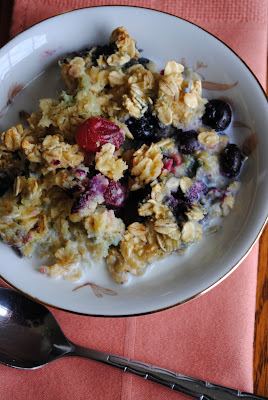 To this recipe, I added 1/2 c. blueberries and 1/2 c. cranberries. Pour all into a greased 9x 9 baking dish and bake at 350 F for 25 minutes. Serve with milk if desired.